As the world of business continually changes and evolves, the need for effective leaders also skyrockets. To become a truly empowering enterprise, a business must develop leaders throughout the organization. In fact, the organization of the future is one where everyone is a leader. It is only when people can lead themselves that they can genuinely be creative and innovative. 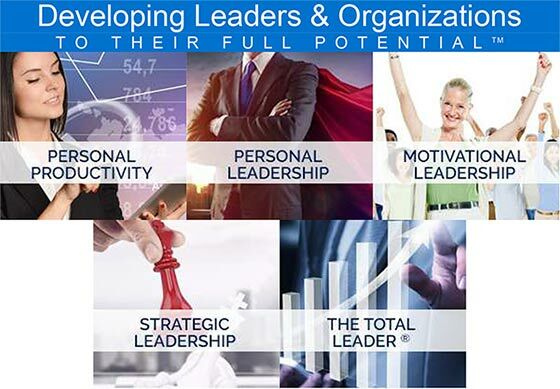 These beliefs led to the creation of the Total Leader Concept … a dynamic and innovative development process that focuses on magnifying potential and creating great leaders. The process addresses four critical levels that a person must master in order to become a Total Leader. Through our hand-in-hand development process, we can help you and your people achieve that ultimate goal. What defines an effective leader? Dynamic leaders excel in people skills and the ability to create a motivational environment. They focus on their vision for their organization, clearly communicating defined goals to the people within that organization. They value their employees and customers and genuinely listen to them. Effective leaders are organized and focused and always keep their commitments.